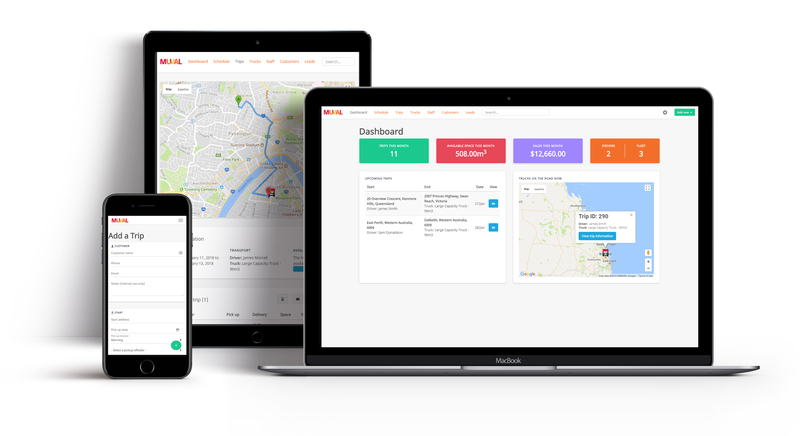 Introducing Muval - the platform that helps you to find and book available interstate removalists truck space in Australia. For the past few months I've been working on my new project: Muval. Muval is a website that helps Australians find interstate removalists truck space and book it instantly online. The whole platform for Muval is comprised of multiple different elements: A cloud-based back-end for removalist companies to manage their upcoming trips and available space, a search engine for customers looking for available truck space, and a logistics portal for businesses who want to form ongoing business relationships with interstate removal companies. Backloading is a term used by removalists for filling the available space in a truck with additional loads from customers. Removal companies often struggle with either a) filling their truck on their way back from delivering a primary load or b) only partially fill their truck with a primary load and can transport more goods to increase their profitability. Muval is a central portal for backloading which helps removal companies by providing them additional work, and helps customers by consolidating the supply of available truck space in one location. The website, built using Joomla and SEBLOD, enables removalist companies to run their business from anywhere. It includes features to schedule trips, monitor trucks via GPS, stay in touch with your customers, create job sheets, track leads, and more.